Incorporated in Singapore in February of 2017, Token-as-a-Service (TaaS) is a closed-end tokenized fund actively contributing to the development of the blockchain ecosystem. 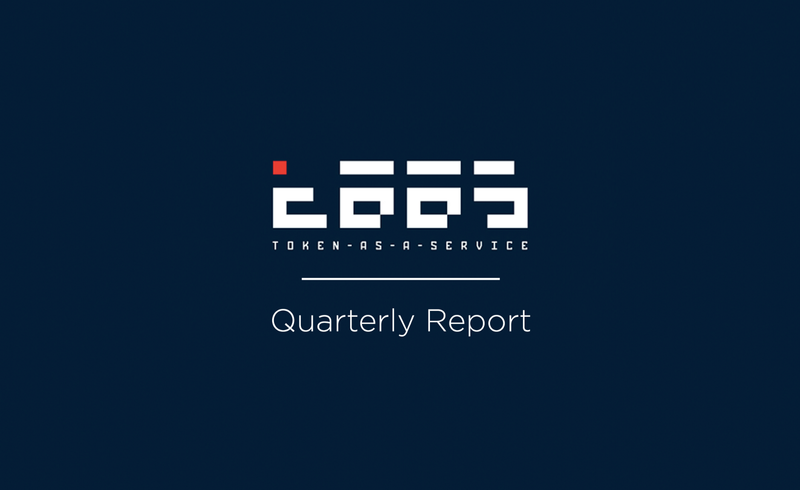 Owners of the TAAS token capitalize on the rise of blockchain markets without dealing with the hurdles, risks and technical barriers associated with owning, transferring and trading cryptocurrencies and tokens. As of January 31, 2019, TaaS maintains a team of 30 experienced traders and developers. TaaS concluded its 1 month-long token sale event on April 27, 2017. The results were independently verified by a world-renowned accounting firm, Grant Thornton: the sale attracted 3,942 participants who contributed 7,569,371.61 USD(T) equivalent. As a result of the sale 8,146,000.78 tokens were distributed, while the rest of the initially minted 101 million tokens were burnt. The price of the tokens (including bonuses) during the sale ranged from 0.8 to 1.0 USD(T)/TAAS. TAAS tokens are built on a profit-sharing Ethereum smart contract, which offers the token owners 50% of the quarterly earnings. 25% of the capital gains are retained in order to increase the capital pool without requiring additional token sales. The premise is that the gradual increase in the net asset value increases the token value over time and the token is therefore explicitly tied to the performance of its parent structure. The rapid development, increasing functionality, growing adoption and global nature of distributed ledger technology (DLT), have led to shifts in the worldwide regulatory regimes that focus on integrity and compliance for DLT markets. At TaaS, we follow leading international business practices concerning KYC/AML policies and regulations. Falling out of compliance hurts everyone involved, so we take care to stay abreast of developments in the field and implement them as need be. In order to safeguard the reputation of the service and protect its users, as well as maintain compliance with the recent developments in the AML/CFT standards, TaaS collects user data, conducts user integrity supervision, and performs activity oversight, particularly by collecting the relevant information regarding the users of the Token-as-a-Service digital system, who purchase and own TAAS tokens. The launch of the identification procedure is scheduled for the first half of 2019, however TaaS reserves the right to amend the timeline, as the case may be. Relevant details and guidelines will be announced via the official social media channels, as well as on the official website. Aiming to streamline the identification process, TaaS partnered with an experienced third-party service provider. Users will be kindly requested to fill in the initial form on taas.fund website, then check their inbox, and simply follow the identification procedure described in the email, via designated smartphone apps, or web interface. Document image check. Personal data used: Identity document and information describing the identity document, check status/outcome and related tracking information, biometric data. Facial similarity check. Personal data used: photograph/video of the User’s face, identity document and information describing the identity document, check status/outcome and related tracking information, biometric data. Watchlist report. Personal data used: full name, address, and postcode, date of birth, PEPs and sanctions related data, check status/outcome and related tracking information. TaaS reserves the right to request users to provide such additional information, as may be required by applicable laws and regulations. TaaS is committed to safe and secure storage / transfer of any collected user-related data, internally and, as the case may be, using third-party services, including but not limited to, the identification service provider. TaaS would also like to use the opportunity and kindly remind the highly-esteemed Community that Token-as-a-Service may not be accessed by USA and Singapore citizens and residents. As you are well aware, TaaS restricted USA and Singapore citizens and residents from purchasing and owning TAAS Tokens (cryptographic tokens serving as proof-of-membership for the Token-as-a-Service the digital system). The action was taken to comply with applicable laws and regulatory guidelines on securities and digital tokens in the relevant jurisdictions, ensure effective fulfillment of the legal requirements and to manage the risks associated with infringements of the law, possible fraud, and scams. Citizens or residents of the USA, including Puerto Rico, the U.S. Virgin Islands, and any other possessions of the USA, or Singapore or any possessions of Singapore, are prohibited from purchasing or owning TAAS Tokens. The purchase or ownership of TAAS Tokens by USA and Singapore citizens or residents may constitute violation respectively of Singapore or USA laws by such individuals. The purchase or ownership of TAAS Tokens is allowed only in the case when such acquisition or storage is legal and will not violate applicable laws. Should USA or Singapore citizen or resident occur to own TAAS tokens (e.g. at an unregulated exchange/platform, or otherwise), TaaS strongly recommends such users to discontinue ownership of TAAS Tokens, by way not forbidden by applicable laws and regulations. Note: The Company provides users with general information to help such users be compliant with applicable laws and make a valid resale or transfer of ownership. Such consultation on the matters of resale should in no way be deemed or treated as a financial or legal advice of any kind under the Financial Advisers Act of Singapore or relevant regulations of other jurisdictions. In the case that a user refuses to discontinue ownership of the TAAS Tokens, TaaS would like to inform such user, that the possession of TAAS Tokens by such a user might be illegal in accordance with the laws in his/her jurisdiction, recommend that such users to promptly suspend possessing TaaS Tokens, and suspend membership in the Token-as-a-Service digital system. 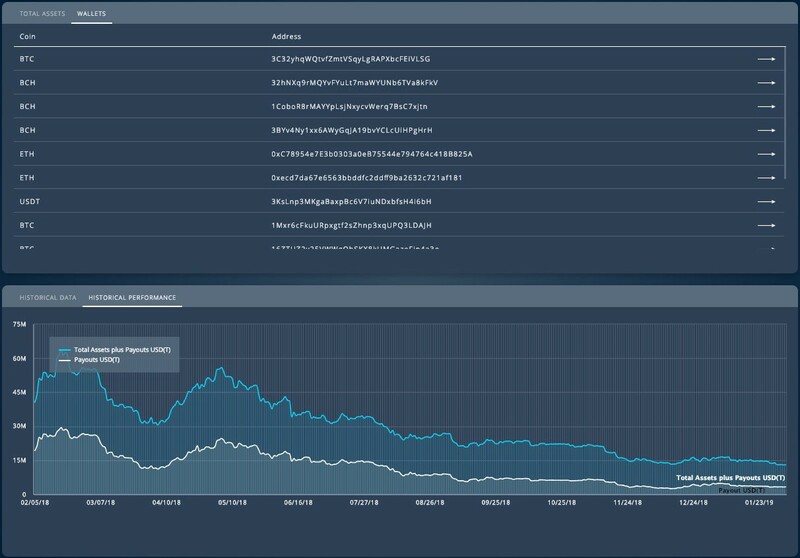 Within the first half of 2019 support of the WebWallet (https://wallet.taas.fund/) will be discontinued. The exact date will be officially communicated in a separate announcement. hardware wallets (e.g. Trezor and Ledger). Any issues related to the use of the wallet should be addressed to support@taas.fund. In order to keep its activities transparent and visible, TaaS maintains an in-house technology known as Cryptographic Audit (CA), which is a set of monitoring tools accessible by any member of the public who currently owns or is considering the purchase of TAAS tokens. CA is fine-tuned to provide its users with up-to-date information on the underlying assets held in crypto wallets and trading accounts on exchanges/platforms, details of the early-stage contributions and other assets with limited liquidity, as well as the list of wallets used by TaaS. In order to ensure the safety of the underlying assets, TaaS utilizes secure wallets including multi-signature hardware storages, as well as in-house and trusted third-party software solutions. The list of designated storages used by TaaS is provided below. Processing of the quarterly payouts is carried out by using Ethereum-based smart contracts to provide top-level security to customers of the service. 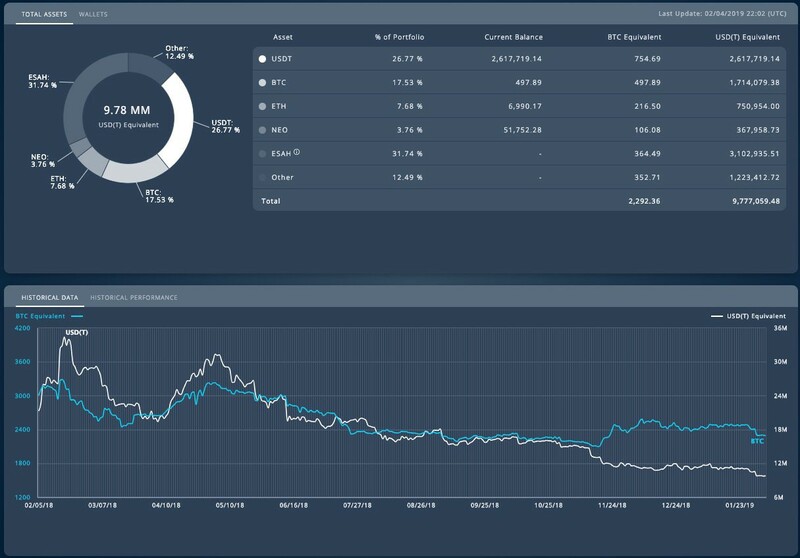 With the global crypto markets downtrend, TaaS activities during the reporting period were mainly focused on effective portfolio hedging, rebalancing, risk mitigation. The net asset value as of January 31, 2019 equaled 9.78 million USD(T) equivalent, outperforming the market benchmark by (generating alpha of) 4%. 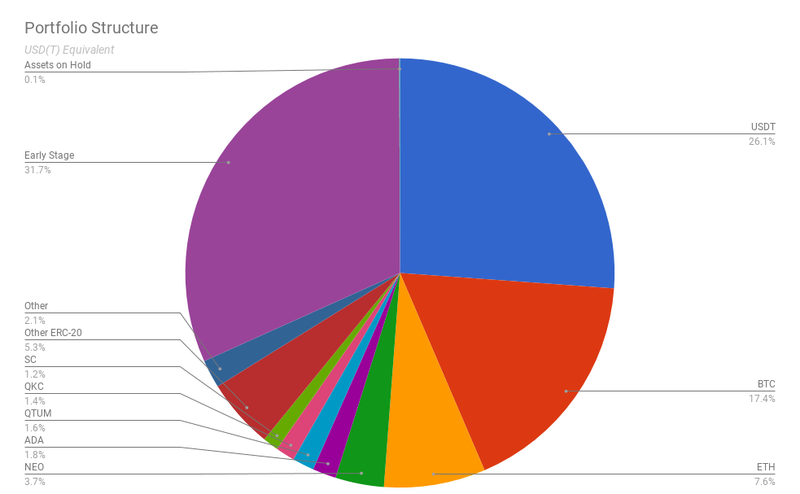 As of January 31, 2019, the share of BTC, ETH and USD(T) in the portfolio comprises 51% (5.01 million USD(T) equivalent), while the share of other tradeable cryptocurrencies (including NEO, Cardano ADA, QTUM, QuarkChain QKC, Siacoin SC, and others) equaled 17% (1.67 million USD(T) equivalent). As of the reporting date, thirteen (13) projects are in their early contribution stage (including Vimana, DreamTeam, RSK Labs and others), and the relevant assets are vested or have limited liquidity. During the reporting period, TaaS conducted due diligence on a number of potential allocations, which are expected to materialize during the next operational quarter. In order to diversify to low-risk activities, TaaS continued developing and testing a number of arbitrage and algorithmic trading strategies. As of the day of this Report, TAAS tokens were listed on the following exchange/platforms: HitBTC, Bancor Network, Livecoin, CoinExchange, EtherDelta, Zapple and Orderbook. As of January 31, 2019, the token price equaled an equivalent of 0.256 USD(T)/TAAS. TaaS market capitalization approximated 2.08 million USD(T) equivalent. 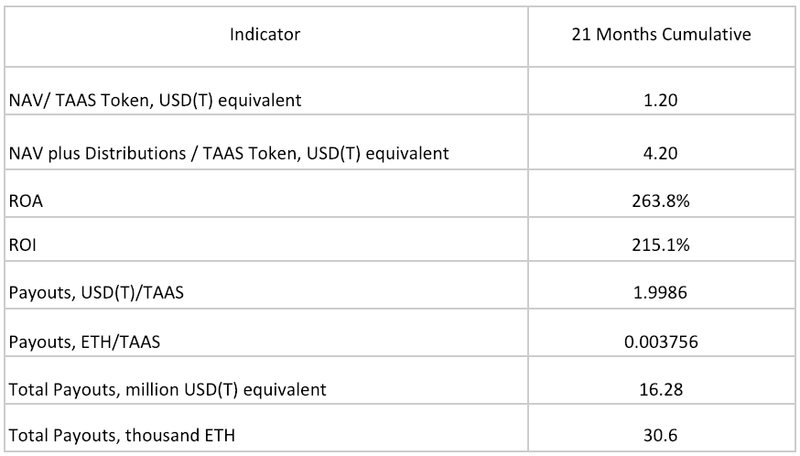 Based on the results of the reporting period TaaS outperformed the global cryptomarket by (generated Alpha of) an est. 4%.